In memory of and located very near the first geocache. Please read below as the coordinates are close, but not exact to the location of the cache. I decided to go find Dave's "Original Stash" today. While reading up on the location, I noticed the post saying it had fallen victim to the elements. So, I put together a new stash to replace it with, should that info be true. If not, I could place this stash elsewhere later. Upon arrival, I searched, and searched, and searched, but for the life of me couldn't find Dave's first stash. then, as I was about to forget it and place the new "Original" stash, I saw my dog sniffing around the stump of a small tree. Bingo! Good girl! Just beside a group of stumps from what had been very small trees, half covered with debris, was the black bucket. The lid was about 3/4 over the top. 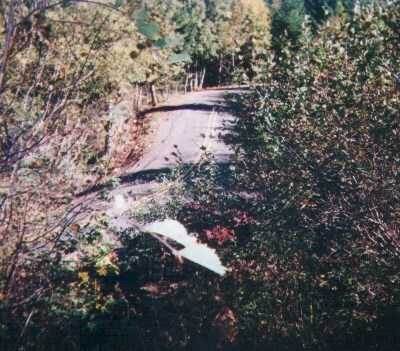 I'm guessing the trees existed when Dave planted the stash and it was probably discovered (and possibly plundered) by some ODOT workers clearing brush along the road. Currently, there is about 5 feet of clear space between the stash and where the brush starts along the hill. I lifted off the lid to find the bucket full of water and debris. Just as they said, this one's a wash. I rolled up the sleeve and began rooting around in the bucket with my hand. Sure enough, after cleaning out the leaves, sticks, etc., all that was left was the can of beans. I dropped them back in the dismal abyss and covered the bucket as best I could with the semi deformed and cracked lid. I took some pics of it in the state I found it and with the beans beside it. I felt it a shame to see the world's first GeoCache in such sad shape, so to that end, in honor of Dave and what he's done for us, I placed what I'll call the "Un-Original" stash very nearby. This one, though, is up the hill far enough that it shouldn't be discovered accidentally. It's within 10 yard of the Original Stash and fairly easy to get to. Be careful of the stickers and don't step in any of the hundreds of mole (?) holes. (nccebk 10' ybat k 4' qvnzrgre). Va gur bcra raq bs n arneol snyyra gerr, lbh'yy svaq gur "Ha-Bevtvany" fgnfu.